San San and her brother Ah Liam return home from school one day, expecting a normal afternoon with a snack and time with their grandmother. Instead, they find that their grandmother has smashed a portrait of Chairman Mao with a hammer. Ah-Liam is conflicted, but ultimately decides to confess his grandmother's crime to the Communist Party. Soon the family has no choice but to try to flee the country to Hong Kong, lying that their father is ill. But the government will only grant three visas--one to mother Seok Koon, one to grandmother Bee Kim, and one for just one of the children. Seok's impossible choice will lead each of them to situations they never imagined. Bury What We Cannot Take maintains a level of tension rarely seen in books other than thrillers. From the first pages when the children make their discovery, there is a very real possibility that someone will be imprisoned, killed, or lost to their family forever. This powerful book looks at the process of making difficult decisions and the repercussions that we never imagined. Everyone in this tale makes choices--Bee Kim made the choice to destroy the picture, Seok Koon decided which child to take to Hong Kong, Ah Zhai left his family to pursue another life in Hong Kong, and Ah Liam chose to put party ahead of his family. The only one who doesn't make a definitive choice is San San, but she is the one who must deal with the consequences. Kirstin Chen is a writer who is careful and precise with her words. 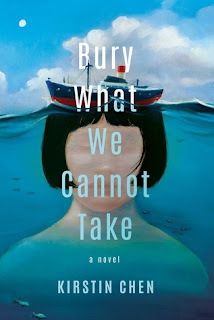 Beautiful writing and a tense and powerful story of the uncertainty of living in Communist China make Bury What We Cannot Take a book you don't want to miss.